I throw the gauntlet down: I am, without a doubt, the most passionate chocoholic food blogger in UAE. I love chocolate. It loves me (on the hips no less). Little did I know I was nearly going to drown in it. Really. During the Eid break, I decided to boldly go where I have not gone before. One of the places that has been slowly beckoning me for a few months now has been the Vintage Chocolate Lounge in Dubai Mall. So I walked in and started looking at the menu. There was a lot that caught my eye and I wish I had someone with me at that point because I would’ve sampled a lot more than I actually did. 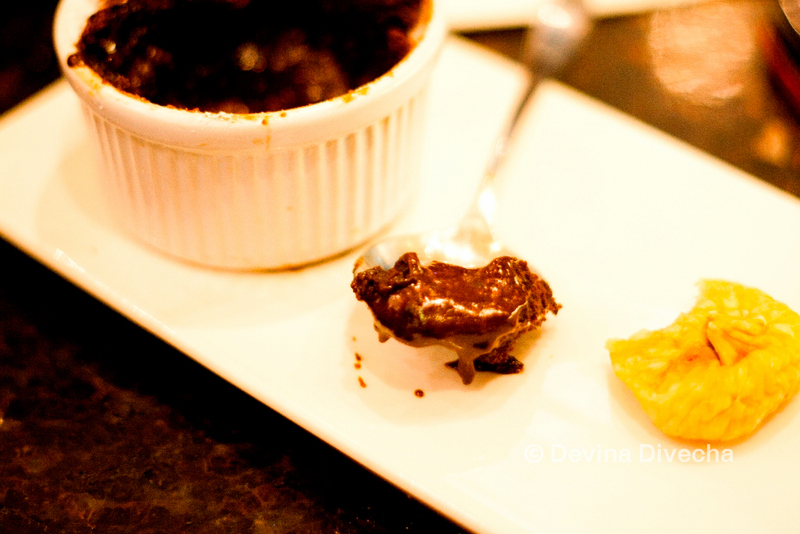 I mean, names were leaping out at me: Chocolate Sushi (potentially the only way I will ever have anything resembling sushi), Fondue (Oh Yasmin, remember our fondue adventure? ), Cocoa Crepes, and SO MUCH MORE. Chocolate-gasms going on right there. And I hadn’t even eaten yet. Little did I know how hot it was going to get. I decided to try the chocolate shot with cinnamon sprinklings, and the hot chocolate soufflé. 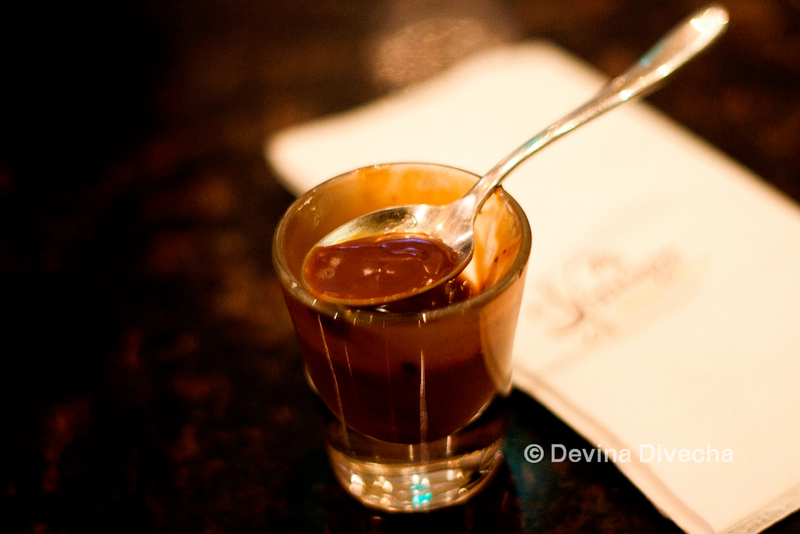 The chocolate shot arrived first. Now, don’t make the mistake I did: I thought it was a “hot chocolate” shot. So I swigged the little shot glass and nearly choked on…pure chocolate. You know, the thick, yummy, warm, oozing chocolate bakers make when they want to…uhh…bake stuff? That. It was just…chocolate. With a hint of the cinnamon I’d asked for on top. I moaned. I am not joking. This was the beginning of slowly succumbing to nothing but chocolate… chocolate-gasm currently in build-up mode. 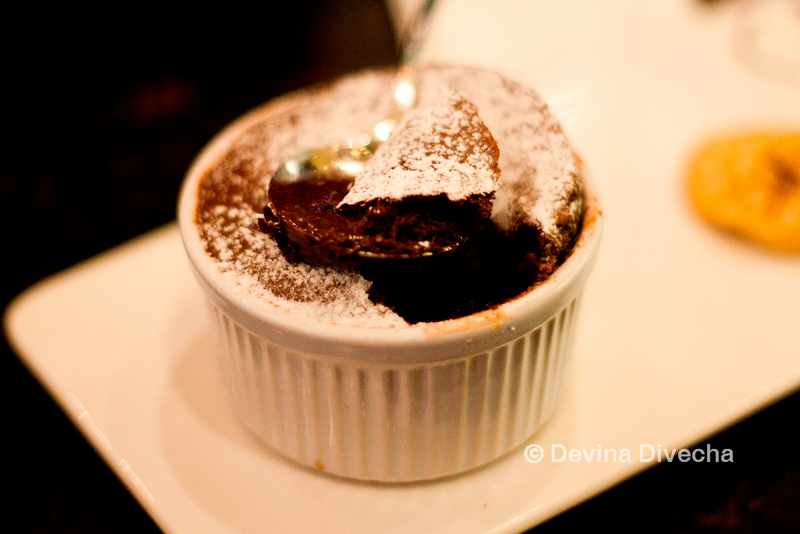 Because then…the hot chocolate soufflé arrived. I took my spoon and gingerly poked the top crusty layer that collapsed into the innards of that white bowl…and splashed into really hot…hot…sinful chocolate. And then when I put that spoon in my mouth, I moaned again. 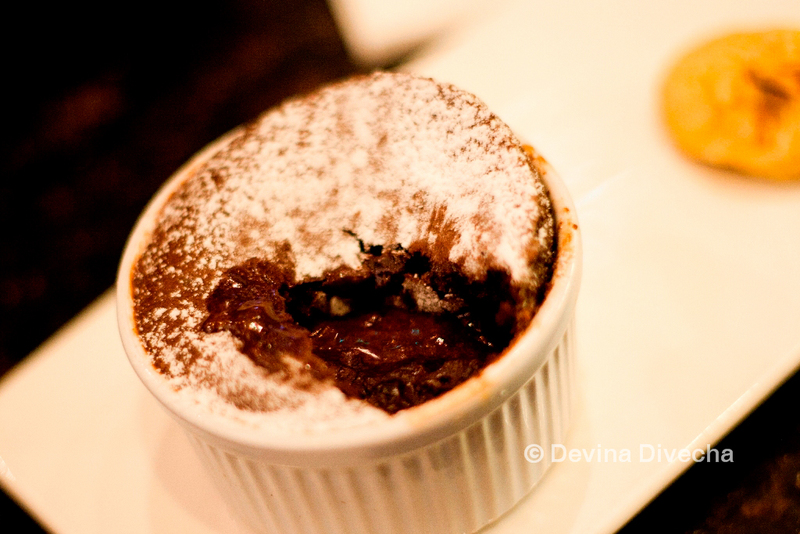 That’s some serious chocolate soufflé going on there. It was great to mix the slightly flaky, crusty top with the really hot chocolate inside, along with some cake-y textures in there. Chocolate-gasm now at peaking point. I finished the hot chocolate soufflé and slowly swirled the last molten bite inside my mouth. Chocolate-gasm update: my tongue exploded. The end. 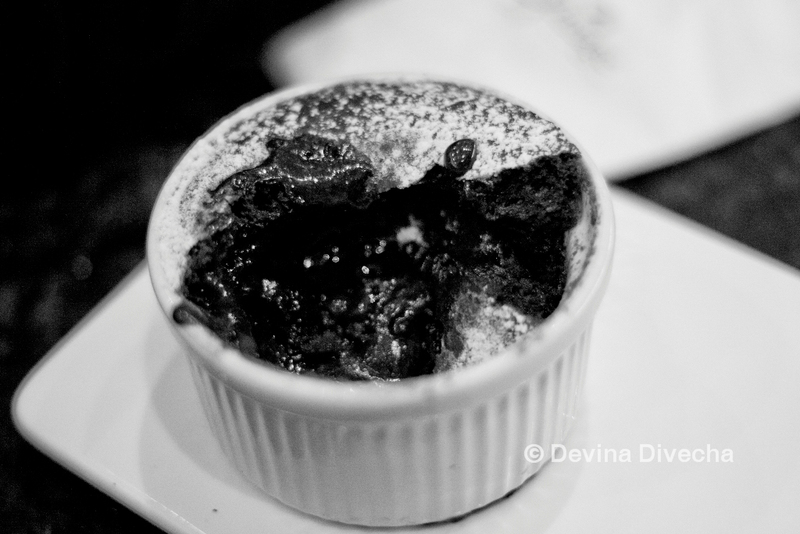 Practical Tip: I ordered chocolate ice-cream along with the chocolate soufflé but I forgot about it because it didn’t arrive with the plate, and it came to me just before I finished the soufflé – but trust me, you don’t need anything more than the basic soufflé. It’s gorgeous on its own. For more info, check out Vintage Chocolate Lounge’s official website. Also, a parking tip because I know it’s a bit of a maze: head over to the Cinema Parking and try parking on Level 7 anywhere near T, U, V. If that’s full, go to level 6 Cinema Parking (always empty for some reason) and go one level up. The Vintage Chocolate Lounge tucked away in a corner, right opposite Reel Cinemas and that gorgeous little shop called The Noble House (the one where I can buy Arwen’s necklace and pendant, and Harry Potter’s wand and Gimli’s axe and more). The passion that drips through your food-writing is just so..me. I love your blog! And I love this piece! I salute you for the amazing pictures too that you’ve taken at the risk of rudely interrupting the chocolate-gasm hah.I HAVE to visit this place for the Chocolate Shot. Hehe @dinamurali … I kept noticing the lounge because of the interiors too! And finally I could take it no more haha. Yeah I definitely want to go back with more people so I can try more items. It’s really rich chocolate, so must go on an empty stomach if you can! Aww thanks for the comment, @TheLalloo. Hahaha yeah I had to take pictures…who would take my word for it otherwise? 😀 But the chocolate was good enough to sustain the chocolate-gasm through the picture taking, I must say. Yeah, definitely try it out and let me know what you think! oo-er Dee – you enjoyed it then?!! Fabulous pics and good idea to include a parking tip. VERY useful. Haha yes Sally (@Sally2hats); completely enjoyed it! Yeah parking is always an issue there if you’re not sure where you’re going. I’ve often parked somewhere and emerged at the complete opposite end of where I want to go. Having learned my lesson, I now research for a bit before heading to Dubai Mall so I know exactly where to park :)Thanks! I enjoyed clicking these. All this chocolate does look orgasmic. We need to go here together soon as I’d like to get some chocolate on my hips. I meant lips… Lips. I love chocolate and this is a sinful post..so much of chocolate..mmm… love it. Now I too need to go there soon. Love the chocolate mousse, looks really good! Yasmin (@YasminMebar) – yup, it does, doesn’t it? There’s lots more where it came from, so let me know when. I’m all too ready to go back to this place. Raji ( @vegtastebuds ) – Thanks for dropping by. If I had more people with me, there would’ve been more chocolate on this post 😉 Haha, judging by the responses, we should have an FiA outing!!! Thanks very much Nadia – your compliments are making me blush! :$Yeah, like I said, parking is such an issue, I decided this was completely needed for this post.Let me know if you end up trying it out. Dammit, I did not know about this place last time I was in Dubai! Another reason to say life’s unfair! The chocolate looks gorgeous!